My house is in a semi rural area and many of us seem to have some sort of fence. 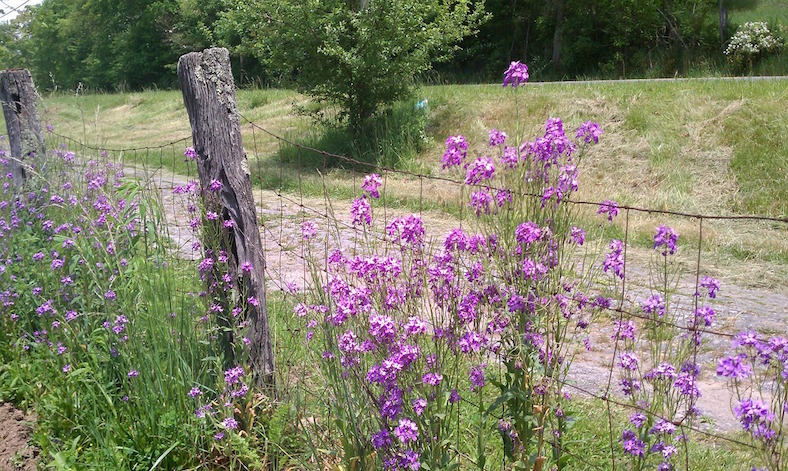 I have field fencing — constructed of wire squares, strung tightly to wooden posts every eight feet or so. It does a good job of keeping dogs in — and away from eating the pet geese next door. Several houses have invisible underground fencing for dog control. Six foot high wooden fences that surround back yards are common enough and sometimes I see chain link fencing used. One house near me has just had black wrought iron fencing installed. My neighbors have super tall fencing around their huge and beautiful garden, to keep the deer from decimating their vegetables. Robert Frost said that good fences make good neighbors and we seem to have a pretty amiable neighborhood. Maybe he was right.